Rishi Kapoor wishes his uncle Shashi Kapoor on his 81st birth anniversary by sharing pictures of him with the family. On the occasion of the 81st birth anniversary of late actor-filmmaker Shashi Kapoor on Monday, his nephew and veteran actor Rishi Kapoor got nostalgic. Rishi took to social media and posted two photographs of the Deewar actor when he was conferred with Dada Sahab Phalke award in 2015. 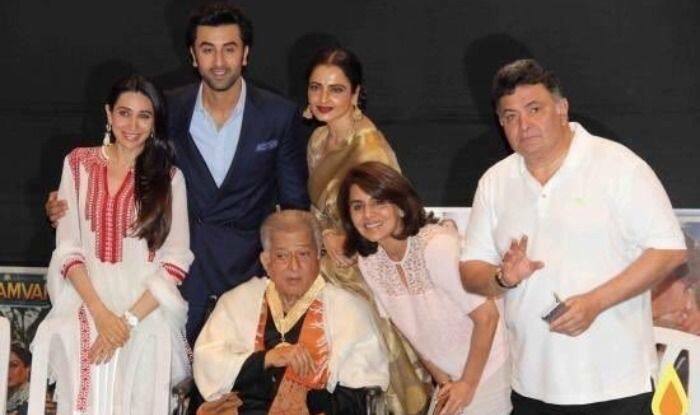 “Happy Birthday Shashi Uncle,” he wrote along with a photograph in which he can be seen posing with Shashi, Neetu Kapoor, Karisma Kapoor and Ranbir Kapoor. Rishi, who is currently undergoing medical treatment in New York, also shared a photograph of Shashi with his children — Kunal Kapoor and Sanjana Kapoor. “What a proud moment for the Shashi Kapoor family! Dada Sahab Phalke award for him. Third Phalke Award in the family! Happy Birthday uncle,” Rishi added. Shashi, the youngest brother of famous Kapoor brothers of Bollywood, made his onscreen debut in his elder brother Raj Kapoor’s directorial film Aag as a child actor. And in 1961, Shashi debuted as full-fledged hero in Yash Chopra’s film Dharmputra.